This beautiful blue eyed cat has staked out a spot on the bed. 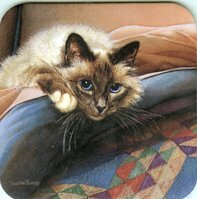 This cat beverage coaster is 3 3/4" square and is cork backed. The design is plastic laminated so it is heat and water resistant.